DC Comics Announces a New Superman Book! Today, on the first day of the New York Comic-Con, DC Comics made one of the biggest announcements since the relaunch of their entire line. 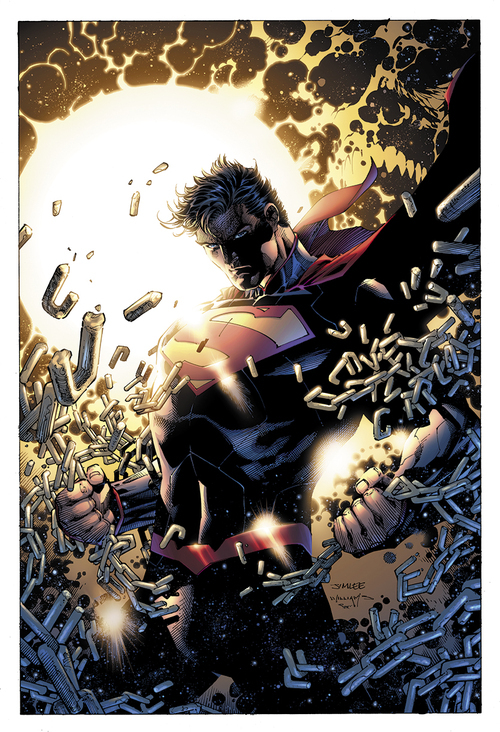 The world's bestselling comic book artist and DC Co-Publisher Jim Lee is teaming up with literary comics favorite Scott Snyder will be teaming up to launch a brand new, ongoing Superman title in 2013. Next year is Superman's 75th anniversary and sees the release of a blockbuster film in a new franchise, it only makes sense for DC to be launching a new series with two of their most talented employees. Snyder, currently writing some of the best Batman comics I've ever read, tells me that this Superman story is "the story I'd write if I only got one chance to do the character. I've been developing this story, it's epic in scale, and I'll be setting Superman through challenges that will shake him to his core. Jim [Lee]is great at capturing those absolute moments of a character and I couldn't be more thrilled to be working on this." It's not hard to imagine how difficult Scott will make things for Superman, and we love our characters more when they're forced through the most strenuous situations so we can see what they're made of. His work on Batman is currently proving that Bruce's adopted, masked family is admirable, but a significant vulnerability. Superman loves more purely and deeply, giving him many more raw nerves for these two to manipulate. For his part, Lee tells me, "In recent years, I've tried to work with the best writers in the business. I've been watching Scott's career and loved what he did on Batman." The story they'll be bringing to the table is one that Scott pitched at San Diego Comic-Con. The pair sat down at a breakfast meeting and Scott explained his story and his enthusiasm grew when Jim began describing how he saw the key moments and how he'd draw them. Listening to their enthusiasm as they spoke of their artistic partnership and this piece in particular was infectious. Though they gave little indication as to what the story was going to be about, listening to them talk made me feel like we're going to be in for something special. Scott did explain his approach to the story, saying, "I tried to take all of Superman's greatest strengths and turned them into weaknesses, turning them on their head to challenge him. There's new things and they will surprise you, it has all the iconic moments you'd want, but it's still classic Superman even though it's fresh and different." What few elements of the story he did tease were the characters we'd be seeing. All of our favorites, "You'll see Lex Luthor, Lois Lane, Lana Lang, Perry White, even Bruce [Wayne] makes an appearance. Jim Lee finished by saying the ending of this story would give Superman fans something to talk about for years to come. As they unveiled their plans for a new Superman book, they also released an image for the series which they've graciously provided for us to gawk at below. The book hits shelves in 2013. Bryan Young is an author and the editor of the geek news site Big Shiny Robot!